In 2012, after a long career as a nutritional and preventive cardiologist, I began working with patients who wanted to use cannabis as medicine. Over the next two years, I worked with over 3000 patients, helping them to use cannabis for everything from migraine headaches to Crohn’s disease. I did see a few cancer patients and most only wanted to use cannabis to relieve symptoms of their chemotherapy. In 2014 a patient with liver cancer asked if cannabis might be used as the primary treatment for his cancer. I had seen a few articles in the medical literature describing the use of cannabis in preclinical studies; studies using animals or using cannabis to kill cancer cells growing in a petri dish, but I couldn’t honestly answer the patient’s question because I had no experience in this area. I suggested he use an extract in a syringe that was available at a local dispensary in California. Later in 2014, while attending a medical cannabis conference for medical professionals in Denver, I saw x-rays of two patients with brain cancer who had used cannabis to treat their brain tumor and the tumor had definitely gotten smaller under the influence of the cannabis. From that point forward, I knew that my medical mission in life was to learn how to help patients use cannabis to treat their cancer. I will be forever grateful to the presenter at the Denver conference, Mara Gordon, for teaching me what she knew about using cannabis as an anticancer agent. Since that time, I have worked with about 400 patients who wanted to use cannabis as part of their anticancer treatment. Cannabis can be used with chemotherapy if accommodations are made for drug metabolism. When searching for cannabis research, I create Google Scholar alerts, so anything published in the medical literature on the use of cannabis to treat cancer comes to my inbox. I’ve learned a lot and have refined the therapeutic protocol considerably since 2014. In October 2018 I was invited to present at the very same conference in Denver that got me started on this journey. 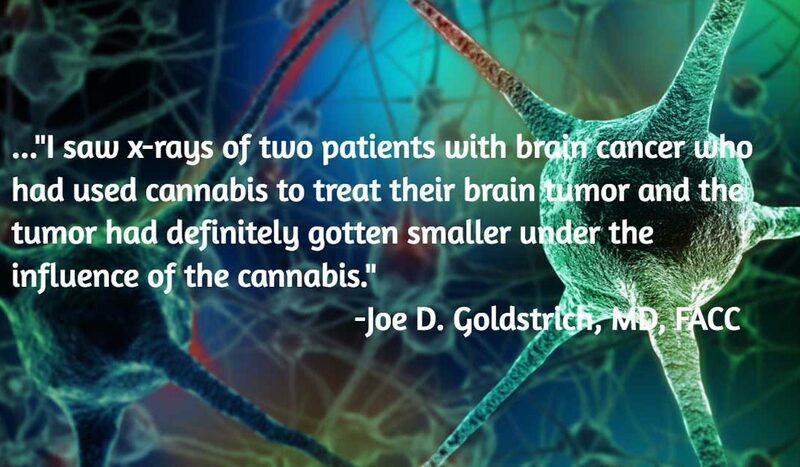 I was asked to share what I had learned about using cannabis to treat cancer. What follows are those findings in a condensed form. The cannabis plant contains over 500 compounds. The latest research has identified at least 144 unique cannabinoids, over 200 terpenoids (the compounds that give the plant its aroma) and other compounds called flavonoids and polyphenols. Working together, as an ensemble or entourage, these compounds can cause cancer cell death. Tetrahydrocannabinol (THC) is the main cannabinoid responsible for inducing cancer cell death (apoptosis). Cancer cells almost always have a cannabinoid receptor on their surface and when THC binds to this receptor, a series of events is often initiated that leads to cancer cell death. However, researchers from Spain and Israel have shown that when THC is accompanied by other compounds in a full plant extract, cancer cell death more likely and the is enhanced. THC (and CBD) can also stimulate the cancer cells to oxidize themselves. For this reason, I do not recommend the use of antioxidants when cannabis is being used for anticancer therapy. THC also helps shut off the blood supply to the tumor, stunt tumor growth and prevent metastases. Some tumors are more responsive to cannabidiol (CBD) than others. There is a gene called ID-1 that is prevalent in very young children. This gene simulates cell and tissue growth. As children get older, the activity of this gene declines. Certain tumors reactivate this gene and when reactivated, it can contribute to cancer cell growth and metastasis. CBD can help inactivate ID-1. In addition, CBD can directly kill cancer cells through several mechanisms unrelated to the receptors that bind THC. Each cannabis chemovar (the preferred term to replace the word strain*) has a different chemical makeup or entourage/ensemble. If all the compounds needed to support THC and CBD are not available, the cancer-killing capacity of the extract may not be fully powered. Some of these essential cannabinoids don’t even have a name yet. In an attempt to include all of the cancer killing compounds necessary, some physicians have begun recommending combining extracts from several different cannabis chemovars to enhance the anticancer treatment. The unheated cannabis plant does not contain THC or CBD. It contains the acidic forms, THCA and CBDA. These acidic compounds are converted to THC and CBD when heated. These acidic compounds work differently in the body. THCA does not bind to the cannabinoid receptor on the tumor cell. CBDA does not deactivate ID-1. However, THCA and CBDA have anticancer activity via different mechanisms. There is still much research to be done but it appears that THCA may be more potent than THC when treating prostate cancer and CBDA may be as important as CBD when treating breast cancer. In addition, CBGA, (and CBG) also found in the raw plant, may also have anticancer activity. Adding raw cannabinoids to the anticancer protocol may be helpful for certain tumor types (the prostate, breast, etc.). There are a number of solvents that can be used to extract the cannabinoids from the cannabis plant. Ethyl alcohol, carbon dioxide, butane, and other solvents have been used. Each solvent has different chemical properties and will extract different compounds from the plant. Because we don’t yet know which specific compounds are needed in the entourage/ensemble to cause the highest possible cancer killing, some physicians are suggesting that patients combine medicine extracted from more than one solvent. Cannabis oncology is an evolving and emerging specialty that will become more and more effective as we are able to compile the results of multiple clinical trials that sadly have not yet even been started. *Strain is a term used to describe bacteria and viruses but is not applicable to the plant kingdom. The proper term to describe varieties of cannabis is Chemovar. For example, you wouldn’t go to the grocery store and ask which strain of lettuce, iceberg or romaine, would be best for your salad tonight. Joe D. Goldstrich, MD, FACC is a retired cardiologist with a focus on nutrition. Currently, Dr. Joe is a cannabis clinician and spends most of his days researching the medical science of cannabis.